The very nature of the workplace is changing fast. Work is getting done from multiple locations, on a range of mobile devices, wherever people are. The competitive landscape is evolving at an equally rapid pace. On the one hand, businesses are facing intensifying pressure by competitors who have been able to achieve parity in terms of service, technology, and price. And on the other, even the most... firmly established companies are facing pressure to keep up with innovative new business models driven by mobility and cloud. Against this intensely competitive backdrop, organizations must transform to survive. This transformation effort requires innovation on many fronts—products, services, business models, and so on—and must be done with ever increasing velocity. For many, the impetus for change is already coming down from the executive suite. Recognizing the need to transform, business leaders have concluded that there needs to be a fundamental shift in the way people work. Why? Because people are the ultimate source of innovation—and IT is in a unique position to enable that change. There is now industry consensus behind the social, mobile, analytics, and cloud (SMAC) paradigm as the new platform on which to build a digital business. And there’s no doubt that this paradigm is having a profound impact on the workplace. However, technology is only part of the equation, and change is never easy. The process of true transformation brings many challenges for the business—culturally, environmentally, and technologically. Technologies and workspaces must evolve to support new ways of working, but there’s also a cultural component that is critical to success. 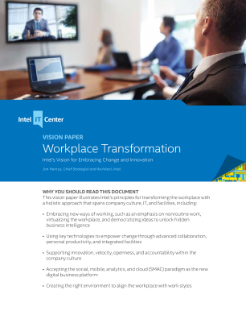 This paper explores Intel’s vision for workplace transformation, from the challenges and barriers to the very principles that can help organizations achieve greater success. Hardware-enhanced identity protection hardens multifactor authentication to help protect against identity theft. Hardware-based security provides endpoint protection without compromising simplicity or productivity. See how business Ultrabooks™ drive increased productivity with anywhere, anytime computing. Employees share what "workplace" means to them and how technology and the Internet drive the transformation.